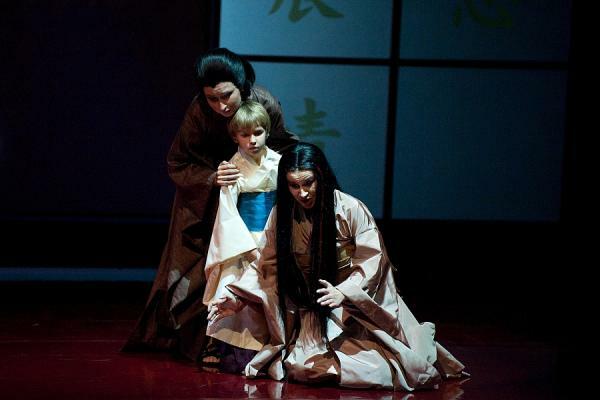 The tragic story of Cio-Cio San, the Japanese woman unhappily in love with an American, has for years remained at number one on the list of the most gladly performed opera works in North America and occupies a similar position in ratings all over the world. So should it be surprising that it is a premiere of Giacomo Puccini’s Madame Butterfly that is opening the new season at the Kraków Opera? However the work has not always enjoyed such popularity. Growls, shouts, laughs, groans and sniggers – through the cacophony of sounds given out by the audience during the premiere in La Scala in 1904, it was impossible to hear a note. This evening, probably the worst in Puccini’s whole career, turned out to be a complete flop… It wasn’t until after a few revisions had been made that demanding listeners – first in Italy and afterwards the whole world – appreciated this opera. Several factors determined its success. First of all, the melodiousness of the arias and the appearance of repeating motifs which come and go throughout the whole work, representing individual protagonists (eg. the American Pinkerton’s musical theme is based on the Star Spangled Banner song, which later became the national anthem of the United States). The second factor is the orchestration – full and varied use of the instrumental ensemble harmonises with the rich layer of emotion in the libretto. Finally the exotic factor – after all, the opera’s plot unravels in Nagasaki and the composer deftly weaves motifs from Japanese folk songs into the Italian opera tradition (his consultant in this matter was the wife of the Japanese ambassador to Rome). Also contributing to the success of the opera was the libretto created by Giuseppe Giacosa and Luigi Illica (based on a play by David Belasco), in which they showed not only an ill-starred love and the conflict between two personalities but also a clash of two cultures. Even though at the beginning she caused Puccini problems, Madame Butterfly became his favourite character. The opera brought the composer fame and a great deal of money. He bought a luxurious yacht with what he earned, which he called of course… Cio-Cio San.